A beauty in very good condition. 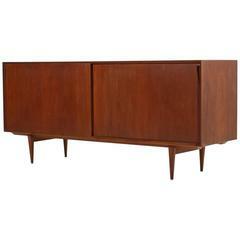 The rare rosewood sideboard was designed by Arne Vodder, produced by Sibast Furniture, Denmark in the 1960s. Model 29A with seven drawers and another door, very clean. Fantastic design, freestanding model, also the back with wood. This rare piece is available with the formica doors in black and white or the beautiful rosewood doors, your decision. Rosewood sideboard model 37 by Arne Vodder. Tambour doors with behind shelves and drawers. The sideboard is in very good condition with beautiful wood grain and deep red / brown color.